OCL was awarded this project due to our ability to provide an all-inclusive, multi experienced team package for bespoke works. The works package was to install a new suspended steel walkway, around the perimeter of the new SER room. 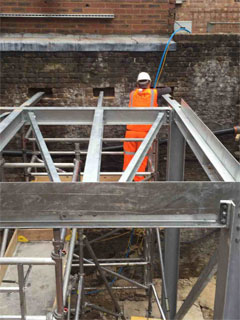 The steel supports were installed so bearing was within the new brickwork and the existing retaining wall. These penetrations had to be carefully “toothed” out, to ensure the new and existing structures were not damaged outside the area of penetration required. These areas were then repaired and re built to create an aphetically pleasing end product.